HARRISBURG (AP) — The union representing striking professors at 14 Pennsylvania state universities reached a tentative contract agreement Friday and immediately ended a walkout that was in its third day. Both sides thanked Gov. Tom Wolf for helping to end the impasse, which had disrupted classes for over 100,000 students. 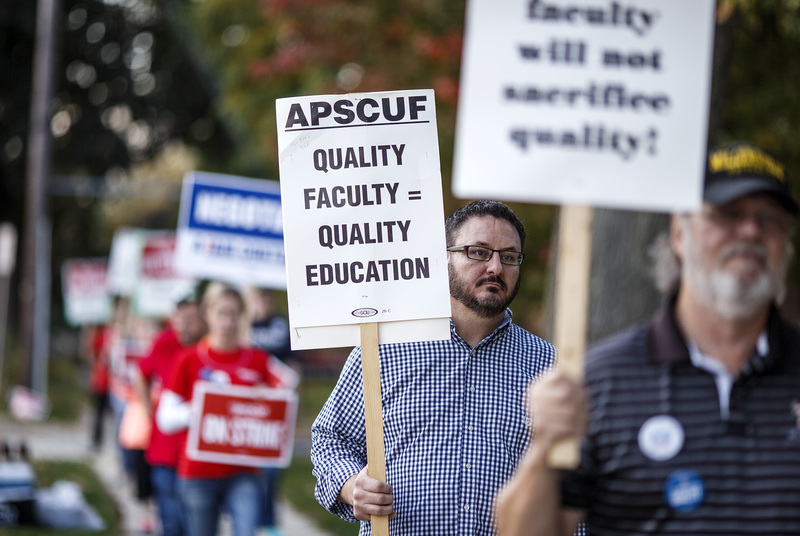 “We are relieved to have an agreement that preserves quality public higher education in Pennsylvania and allows our members to get back into the classroom where they belong,” said union president Kenneth Mash. Professors walked off the job Wednesday morning after the union turned down what the university said was its last contract offer. Union spokeswoman Kathryn Morton said faculty had made concessions on salary and benefits in return for the university system withdrawing proposed contract changes that faculty had opposed. It said it would provide details at a later time. The union represents more than 5,000 faculty and coaches at the state-run universities: Bloomsburg, California, Cheyney, Clarion, East Stroudsburg, Edinboro, Indiana, Kutztown, Lock Haven, Mansfield, Millersville, Shippensburg, Slippery Rock, and West Chester. Penn State, Temple University, the University of Pittsburgh and Lincoln University — schools that receive large state appropriations and offer in-state tuition — were not affected. Striking instructors said they did not strike solely for health benefits or salary, but also to preserve the quality of education for students by supporting faculty at every level of pay and experience. One provision withdrawn by the university system would have required temporary faculty to teach an additional class each semester. The Pennsylvania state system is one of the nation’s largest public university systems. State funding, $444 million this year, is about the same as it was 17 years ago, even as full-time enrollment has risen more than 10 percent. It was the first strike in the system’s 34-year history.